Squeak, Squeak . . . Oh my gosh. Look at the cute little mouse scurrying across the kitchen floor. Put the cats in cages so they don't hurt the wild mouse in the house. Yeah right, like you're really going to hear those words coming from just about anyone's mouth. Not many people want a cute little mouse running around their home let alone a big fat rat. But, that is what crafts are for. If you want a mouse or rat, but don't want to deal with the screaming and jumping on tables then you can just make yourself a mouse craft or rat craft. Then you can put your Rat crafts all over the room and pretend you have an infestation or put the mouse crafts around your cat's favorite room to tease them. Mice and rats are rodents who we associate with types of pests that sometimes land up in our houses, barns, schools, and work. However, if you ever took a look at a mouse, you would notice that they absolutely adorable. So even though mice are pesty, they would be quite cute to make some sort of craft themed after them, don't you think? This page is dedicated to mice and rats...hapy crafting! Sock Mice are much easier to make than sock monkeys. All you hvae to do is fill a sock with stuffing, dryer lint, or crumpled newspapers. Tie it shut with a shoe string, string, or yarn. Knot it shut. Cut out felt rain-drop shapes for ears (basically just draw an oval except bring one side to a point). Use buttons for the eyes and nose. You can put thread through the button holes for whiskers. Use your creativity to make your Mouse Sock Doll unique to you. Cats would love this toy. Here is an easy paper mouse craft...with no folding necessary. Print out either this color mouse template or this black and white mouse template. Then cut out the mouse's body and legs. Then cut slits on the mouse's body where you see dotted lines. Then insert the legs into the mouse's body. 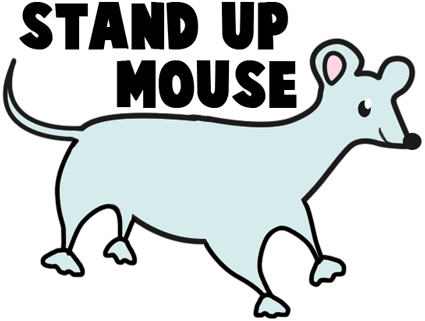 Now the mouse should stand on its own. If you like the above cartoon rat race, then you can make the following paper rat mask by printing out the following rat mask template. Directions are included in the printable. 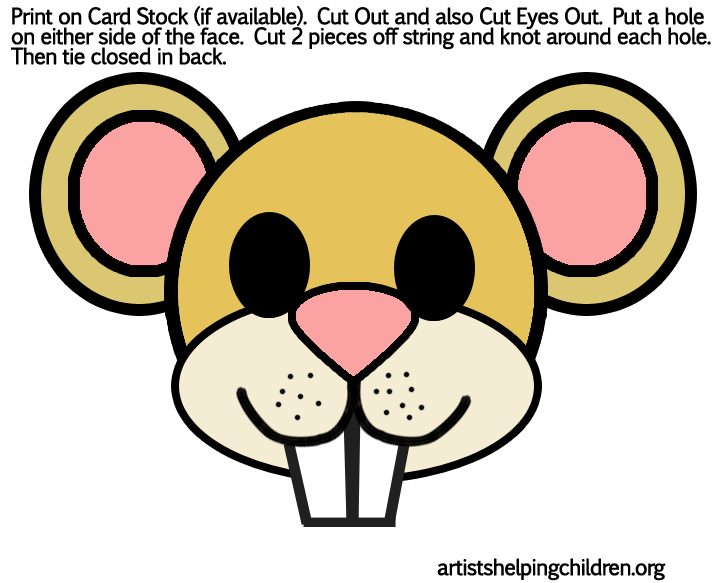 You might also like this paper mouse mask, just print out the following mouse mask template and print out. Pick a mouse or a rat to learn how to draw above by clicking on one of the thumbnail images. Clay Mice - Here are 4 examples of clay sculptures - clay heads, bodies, mice, and turtles. Learn how to make a clay mouse. Beaded Mouse Craft for Kids- - To make this beaded mouse, you will have to follow these instructions. Candy Cane Mouse Craft Idea for Children - - This project , The Candy Cane Craft Candy Cane Mouse is easy to make. Perfect craft for kids. He's a sweet friend for the tree or a package. This project moves us away from the traditional colors, adds whimsy and is simply fun to do! Candy Cane Mouse - Everyone can make this cute candy cane mouse! Candy Cane Mouse Christmas - A super choice for a Christmas party - craft, party favor, holiday scout troop project or in the classroom. this very easy for kids to make! Catnip Mouse Craft to Make - - Give your cats a.pngt from the garden with this homemade pet toy. Catnip Rat Toy - - Your cat will love this adorable, easy to make toy rat. Chenille Mouse on a Popsicle Stick - - This soft and fuzzy guy will surely bring smiles to kids faces. Chocolate Kiss Mouse Valentine Craft - - Say "Be Mine!" with a sweet chocolate kiss mouse Valentine craft. Chocolate Cherry Mice - - For a really special.pngt, package these little guys with a mouse-related holiday book, such as "The Night Before Christmas," "How the Grinch Stole Christmas!," or "The Nutcracker." Christmas Mouse - Cute little mouse craft. Christmas Mouse Ears Craft Making Instructions - - The FreeKidsCraftTeam is getting ready for the Nutcracker Ballet with these Christmas Mouse Ears. City-Mouse Toy Making Instructions - - Basic knitting skills are all you need to create this 9-inch mouse. Clay Pot Rat that is Easy to Make - - This cute little rodent, whether it be a mouse or a rat, is absolutely adorable! A cute clay pot craft for kids for Chinese New Year or a rainy afternoon. Clock and Mouse Craft - - This is a great craft for kids just learning to tell time. Crochet Mouse Magnet to Make - - Kids will learn how to crochet their rat or mouse. Easy Peasy Catnip Mouse - - Weave in any loose ends into the mouse, et voilá!!! You have a catnip mouse! Father's Day Crafts Kids Can Make - - Add some cuteness to your dad's desktop with this home-made computer mouse pad for Father's Day. Folded Heart Mouse Paper Craft Instructions - - A big thanks to Nina for sending in this craft... she even went to all the work of drawing the picture instructions for us! Furry Rat Door Stop - - Using the pattern below make a pattern for your rat, you can enlarge the pattern to any size you like but a realistic size would be around 100% bigger than the pattern below. You can alter this in your image program or just on a photocopier. Good Turn Mouse Crafts - - This saucy creature is a mouse most mothers won't let one in the house. See, this one it has quite a tail, each Girl Scout made one without fail.Take it home and help all week, and for good turns you must seek for every good turn that you do tie a knot in the yarn...make quite a few. Remember why each knot you tied and how much to help you really tried and then next week, please take your turn to tell us all, so we can learn...just what you did to help at home a ready helper you have grown! Heart Mouse Ornament - - Make this cute heart mouse ornament for your Christmas tree. Homemade Mouse Puppets - - Making mouse puppets is an easy, inexpensive and fun craft you can do with kids. Children who can cut and paste can do this craft with a few craft items, and one or two things from your cupboard. This craft is typically suited for kids age five and up, but with supervision pre-school age children will also enjoy cutting, gluing, decorating and then playing with their mouse puppet. How to Make a Clay Pot Mouse Christmas Ornament - - A clay pot mouse Christmas ornament makes an adorable addition to any Christmas tree. Adults and children alike can have fun making these simple crafts. The mouse can be displayed on your tree, wreath or garland this holiday season. Glue a small craft bell to the inside of your clay pot mouse ornament, and you can turn it into a musical Christmas craft. How to craft mixed media rats - - Did you and your child love the film Ratatouille? Learn how to make mixed media rats from a professional art instructor in this free crafts video series. How to Easily Create a Circus Balloon Mouse - - Children will love it when your create a circus balloon mouse for them. They will enjoy drawing a happy face on their new circus balloon mouse. Make lots of these balloon mice for birthday parties and school parties. How to Fold a Handkerchief Mouse - - Making a mouse out of a handkerchief is an old trick that has delighted both young and old for years. Once you've made your handkerchief mouse, you can play with it and even learn how to make it jump around from hand to hand. Learn how fast and simple it is to fold a handkerchief mouse from a standard handkerchief and then entertain the youngsters with this cute little friend. How to Make a Fur Mouse Christmas Ornament - - Decorate your Christmas tree with several cute fur mouse Christmas ornaments for a whimsical addition to your holiday. This is truly a cut and glue craft project that would be a wonderful project for a classroom. Depending on the age of the children involved, you could have all the pieces cut and prepared ahead of time for younger kids to assemble or for older kids, have them follow all these easy steps to create this fur mouse Christmas ornament on their own. How to Make a Mouse Costume - - Want to dress up as a mouse for a costume party? This article will show you how to make an easy, cheap mouse costume, especially designed for those with no sewing ability. How to Make an Easy Mouse Hat for Halloween - - The price of halloween costumes can be exhorbitant these days. In fact, the more popular the costume, the more money you can expect to pay. For instance, if you decided to dress as a mouse, the cost of just the mouse ears can be the most expensive part of the costume. Instead, try making your own mouse ears quickly, easily and inexpensively. How to Make a Paper Plate Rat Mask Craft - - The paper plate is perfect for masks as they have a naturally concave shape, perfect for a human face. Kids can use paper plates to make a variety of masks from monsters to angels to animals, even rats. If your kid thinks rats are cute or wants to portray one of the rats from E.T.A. Hoffman's "The Nutcracker," he'll most likely appreciate this rat mask. How to Make a Pompom Mouse - - Use fluffy pompoms to make a furry little mouse friend - ours is a little pet white mouse with pink ears, but you could use brown, tan or grey pompoms to represent a field mouse. How to Make A Shrinky Dink Mouse - - Whether your child is interested in mice as they exist in nature or merely their cartoon representations, you can encourage her rodent appreciation by helping her create a Shrinky Dink mouse. You and the child can draw whatever mouse you want and then watch it shrink in less than 1 minute in the oven. How to origami a cool rat - - In this three part video series, you will be shown how to fold the origami model "Rat" that Eric Joisel designed. Eric kindly gave me permission to make this video accessible to you. How to origami a rat - - Fold a white origami rat designed by Joost Langeveld. Yeah, it's pretty crazy but nice if you need a new pet. Mac and Cheese Mouse - - Kids aren't the only ones who love macaroni and cheese, and this playful paper plate critter is designed to make sure everyone gets his fill. With a few scraps of colored paper, you can round one up in no time. Make a Mouse Pincushion - Use oddments of cotton fabric to make our cute pincushion. Menswear Mouse Toy - - Treat a kitty to a game of cat and mouse with a few dapper toys. There's no mistaking these critters for the real thing -- they're constructed from brightly colored suiting and shirting fabric. Merry Christmouse - - Like the mouse in the Clement Clarke Moore poem, this one isn't stirring, but he does make a sweet holiday .pngt or decoration, no cheese required. Merry Mice - - Unlike the poetic creatures that didn't stir the night before Christmas, these holiday mice are raring to go. Just place a marble under their walnut shell bodies, set them on a smooth, inclined surface, and they'll race each other to the finish. Merry Mice - - Whether used as.pngt tags or just given as sweet presents all by themselves, these candy Christmas mice are sure to cause a stir. Mice Ornaments - - Sweeten up the Christmas tree with a collection of chocolate mice ornaments. Miss Mouse - From the tip of its big ears to the end of its gray tail, this costume will make your kid feel like the big cheese on Halloween. Mouse - - Enjoy crocheting this adorable mouse!! 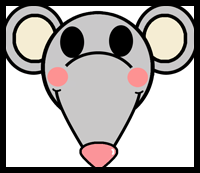 Mouse - - Make this mouse out of paper by printing and following the instructions. Mouse Balloon Animal for Kids - - Making a mouse balloon animal may seem a little tricky for kids, but it just takes practice. You can buy the balloons for this project at toy stores, discount stores, or magic stores. Mouse Box for Valentine's Cards - - You can replicate the same type of craft using craft foam by tracing the template pieces onto foam and drawing on a few of the details. Mouse Costume - - Your little one will scurry to wear this cute mouse costume around the block! Mouse Craft - - The children will have fun making an easy and fun craft entirely assembled with oval shapes. During the assembly process many basic skills can be addressed. Let's get started. Mouse Craft Foam Visor - - Find out how to create this fun mouse visor using craft foam and a few other supplies. Mouse Craft Heart Shape - - The craft can also be adapted to a gerbil or rat theme. The rat is one of the twelve animals in the Chinese Zodiac, therefore, appropriate for Chinese New Year celebrations. 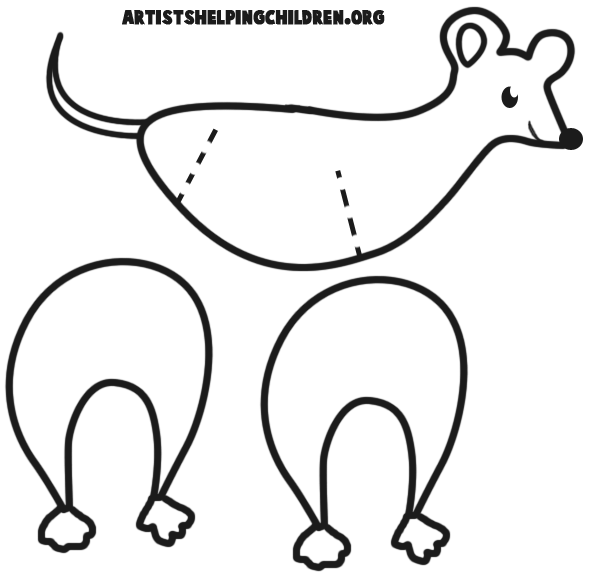 Mouse Craft or Greeting Card - - The children will have fun making an easy and fun craft or greeting card of a mouse almost entirely made with heart shapes (except the eyes & whiskers) and during the process many skills can be addressed. Mouse Ears Headband - - Instructions for making a headband that looks like mouse ears. Mouse Egg Arts & Crafts Project - Courtesy of a hard-boiled egg, vibrant egg dye, a cute pipe cleaner stand, and some glued-on details (paper ears, pom-pom nose, and so on), this critter is an Easter favorite. Mouse Egg - - Courtesy of a hard-boiled egg, vibrant egg dye, a cute pipe cleaner stand, and some glued-on details (paper ears, pom-pom nose, and so on), this critter is an Easter favorite. Mouse Finger Puppet - - This is a craft I do at Christmas with my storytimes when I read "Twas the Night Before Christmas" -- this is the 'quiet as a MOUSE"..... It makes a mouse 'finger puppet. Mouse in a Cup Craft - - Use these free instructions for making a pretend mouse in a tiny cup. Mouse Magnet - - Make this cute mouse magnet and use it to hang your pictures on the fridge. Mouse Pad - - Add some cuteness to your child's desktop with this cute computer mouse pad, a study buddy who'll be as quiet as, well, a mouse. "Mouse" Pad - - Kids will enjoy making this cute mouse pad to decorate their desktops. A great study buddy that will be quiet as a mouse! Mouse Toilet Paper Roll Craft - - This is a fun and easy color, cut and paste craft that uses a toilet paper roll as a base to give the project a three dimensional effect. Mouse Toilet Paper Roll Craft - - This is a simple cut and paste craft that uses a toilet paper roll base to give it a three dimensional effect. Mouse Toy (for Cats) Felt The project requires either sewing or hot glue skills. A child of age 7 or so could do the project with adult supervision. Younger children can help stuff the project. Mr. and Mrs. Christmas Mouse - - Give Mr. and Mrs. Christmas Mouse a spot in your Christmas decor this year. Crochet an easy amigurumi with this free crochet pattern. Aren't they cute! Nutty Mouse Craft - - Normally we don't want to find a mouse in the house, but these nutty little creatures designed by Lorraine of Smithtown, NY are a welcome guest. Paper Bag Mouse Puppet - - Make this adorable mouse puppet by following these instructions. Paper Bag Rat Puppet - - Make a very simple puppet out of a paper bag and some construction paper! Paper Bag Mouse Puppet - Paper bag Mouse is a cool thing to make! Pine Cone Mice Craft - - Instructions to make a mouse out of a pine cone submitted by Debbie. Plant Pals - - Make this plant rat and stick into any plant pot. Play Cat and Mouse Bedsheet Tag - Are you looking for an easy-to-play, fun game? Try Cat and Mouse! All you need is a large bedsheet or tablecloth, a "cat" and a "mouse" and you're set for this silly take on tag! Plastic Egg Mouse Crafts - - These easy mouse crafts are made with plastic Easter eggs that come apart in the middle so you can put in treats. Plushie Mouse - - This project shows you how to sew a plushie sewing pattern to create a toy mouse. Polymer Clay - Christmas Mouse Jar - - This free craft project shows you how to make a decorative jar that can be used for filling with sweets, candy, nuts at Christmas time. They make great Christmas.pngts and can even be filled with a small set of battery lights for a lighted holiday ornament. Rat Craft - - This cute rat is a perfect craft to welcome in the Chinese Year of the Rat! Quickly made with craft cupboard bits and pieces, your kids will want to display him proudly - perhaps you could attach him to the fridge with a magnet, or even make a miniature version for a badge? 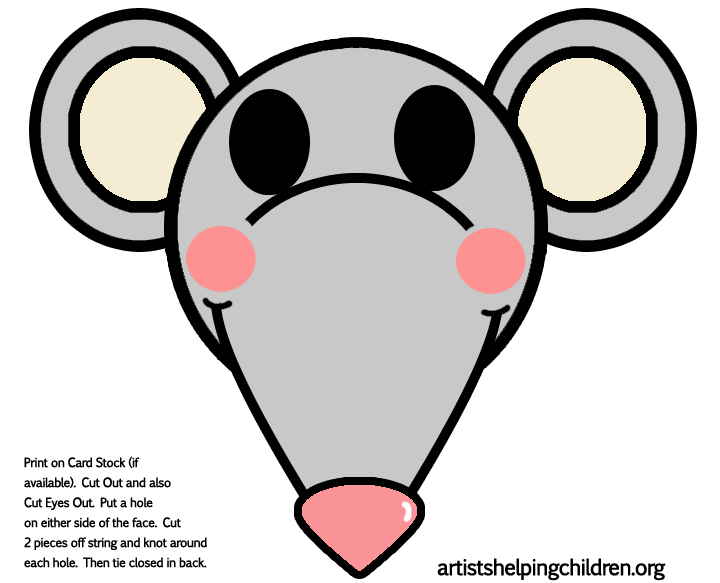 Rat Craft Project - - Here is a rat craft project for you to do. We would love to see what you make, so please e-mail us a picture of your craft and we will post as many as we can the following month. If you or your mom have directions for a craft project you would like to submit, please do so and we will include it in the future. Rat Jigsaw - - Print out onto card, and cut carefully around the large and small rectangles. Rat Mask - - The kids will have fun making - and wearing - this cheerful rat mask for The Year of the Rat! Rat or Mouse Pin - - This cute little rodent makes a great magnet or pin. Make several and give them as.pngts to your friends and family this Chinese New Year! A great craft for other times of the year as well. Rat Race - Scattered along a stair landing, your card-stock cut outs will make a guest's skin crawl. With a feline in pursuit, a game of cat and mouse ensues. Rat Toilet Paper Roll Craft - - Materials you will need for the rat are a tp roll, printer, glue, scissors, something to colour with and a piece of paper (I prefer construction paper). Rita the Friendly Rat - - Fun foam is a fun material for children to work with. It cuts easily, almost like butter, and gives the crafts an added dimension and feeling. This cute little rat is happily eating away at her piece of cheese and would be glad for small hands to create her and give her a place in their homes. Squeaky Mouse - - This squeaky mouse is so cute in gray and pink. This free crochet pattern is a darling.pngt or decoration for your son or daughter's bedroom. Stripey The Mouse - - This free knitting pattern shows you how to make a fun little knitted toy mouse 4 inch (10cm). Styrofoam Mouse Craft - - Turn a styrofoam egg into a mouse in our styrofoam mouse craft! A little paint and a few pipe cleaners are all you need to make this fun farm craft. This craft is much better suited to an older child (younger children will most likely just get frustrated with this one!). Sweet Gum Pod Mouse - - Combine nature and crafts with this sweet gum pod mouse craft. It's a good project to do with Cub Scouts and Brownies, especially for Earth Day. Three Blind Mice Trinket Box - - If you loved the story Three Blind Mice when you were a child then you'll love making this craft. Hold all your fun trinkets in this box. Three Scampering Mice - - What is your favorite story, song, or poem about mice? Create your own little creatures to tell your tales. Tin-Can-Knitter Mouse - - Create these sweet yarn mice using a homemade spool knitter -- a great way to work with bright yarn on a winter day. 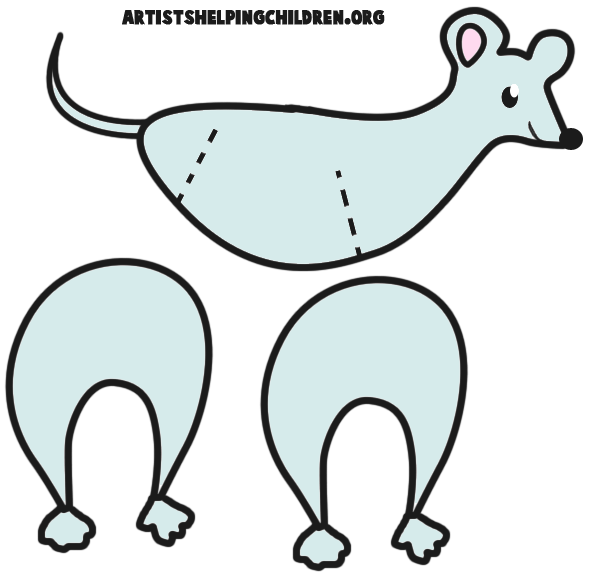 Toy Mouse - - Learn how to stitch your own mouse/rat toy. Tunnel Ratz - - I think tunnel ratz were a late eighties graff crew from sheffield. Cool name. Valentine Mice - - These construction-paper mice tote along lollipops, making them the perfect Valentines to give to pint-size suckers for love. Valentine Mouse Craft - - Make a mouse pocket that you can collect all your Valentine's Day cards in. Year of the Rat Calendar - - Make this rat calendar and put it anywhere in your room! Year of the Rat Magnet - - Place the pompom rat above the sign and glue in place.